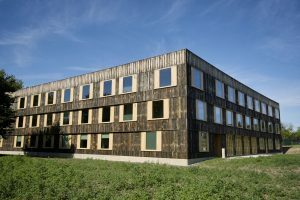 Thanks to our teams’ competence and our extensive stocks of reclaimed French antique materials, we were naturally approached by 6a Architects to supply the selected materials for their project at Cambridge University. 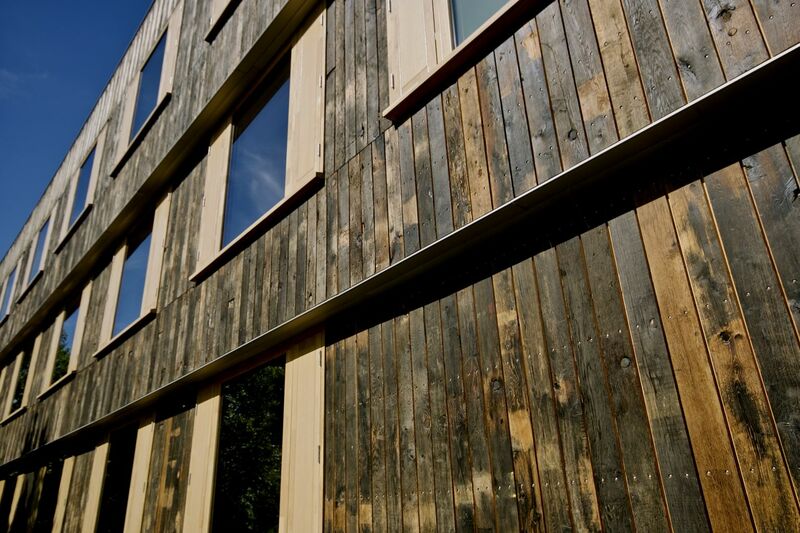 We supplied following detailed specifications laid down by 6a Architects in London, for reclaimed railway wagon boards in oak, so these specifications had to be respected. Churchill College required an additional hall of residence for their Cambridge University students in England. 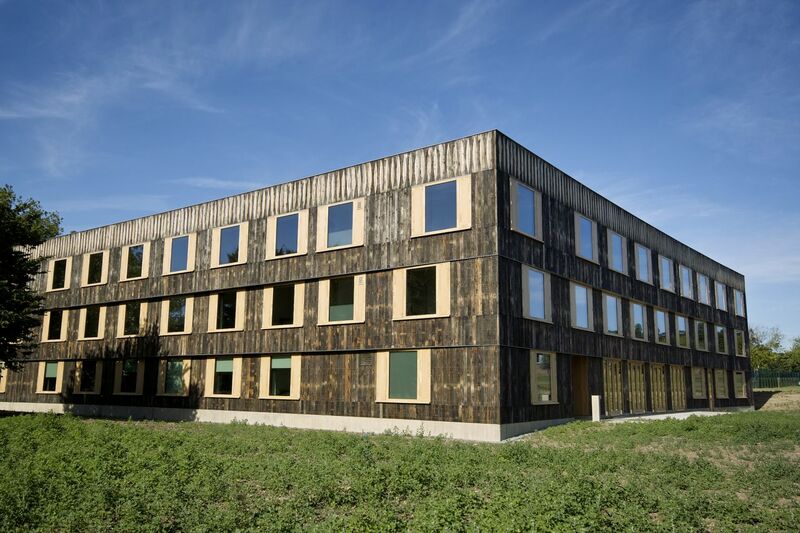 The three floor levels of the new building are clad in these vertical old oak boards in their natural untreated state, thereby evoking the tone of the brick-built buildings already on the Churchill College complex. 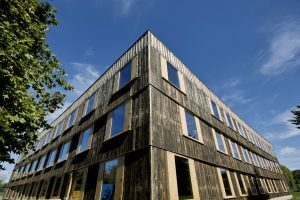 The format of the reclaimed oak cladding was specified by the Japanese architect Takeshi Hayatsu and the English architect Tom Emerson of 6a Architects. These waggon boards clad the new « Cowan Court », a 68 bedroom student residence. The students live here to be close to the university. The architects were influenced by the brick, glass and wood facades of the earlier buildings. The architectural objective was to achieve a contemporary interpretation of the earlier buildings, with a comparable esthetic, whilst retaining a square footprint around a central courtyard. The oak boards, un-treated and natural, are a statement conserving the authenticity of the new building within the history of the complex. Note that the earlier buildings were built in the the Brutalist style (https://en.wikipedia.org/wiki/Brutalist_architecture) which was a post WW2 architectural movement, known for its rugged exposed surfaces, originating from the French work “brut”. Along the upper row of cladding the architect chose to feature a curved relief in each board to respect and echo the interior curved façades of the building itself. Each storey of the building features a slight overhang, the opposite of the tapered curve of a classical column. This is a typical Brutalist feature. When examining the building’s windows, one see an absence of alignment which invokes a slight spiral effect. The exterior landscaping features birch trees thereby creating an informal garden, which is a natural convivial space. This project has been nominated by The Guardian’s architecture specialist as one of the world’s top buildings of 2016. The BCA team are honored to have contributed to the adventure.